The kitchen may be the heart of the home, but the bathroom is the most exclusive. Whether you envision your private bath to be luxurious and bright or demure and sensual, our bathroom renovation experts will help you create that special space. Kitchens are tricky to design and decorate. You need to consider style, function and convenient storage all at the same time. Choosing kitchen décor that balances all these elements can be challenging. 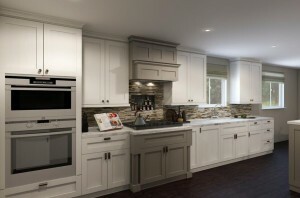 Let our award-winning St. Louis kitchen designer bring your ideas to life. STL Kitchen & Bath Renovations is an award-winning industry leader with an outstanding portfolio of design and remodeling around St. Louis. With our unique process for design build remodeling, we deliver distinctive designs and successful builds that result in outstanding client satisfaction ratings. Our designers avoid cookie-cutter trends, expertly developing kitchen, bathroom and whole-home designs as the individual expression of each client. We’re owner operated, you’ll work directly with an award winning designer, not with a junior designer like at some larger firms. Remodeling your home is a long-term investment. You want to choose a remodeling company that will stand behind its workmanship and materials for years to come. At STL Kitchen & Bath Renovations, we transform homes, foster great relationships, and build clients for life. Call (314) 885-3258 today for a free consultation. A St. Louis Kitchen & Bath Remodeling company, we specialize in kitchen remodeling, bathroom remodeling, and interior design. In other words, we are all about remodeling kitchens and bathrooms. STL Kitchen & Bath Renovations has been remodeling kitchens in St. Louis since 2004. As a family owned and operated remodeling company our reputation is the key to our success, we treat each and every customer like part of our extended family. We are fully insured to protect our customers. This St. Louis, Missouri licensed general contractor has been doing spectacular St. Louis kitchen remodeling throughout the region since 2004. Our kitchen restoration and renovation work reflects our focus on lasting quality, and it showcases the innovative style that sets STL Kitchen & Bath Renovations apart from the regional competition. This St. Louis kitchen remodeling and renovation firm offers a wide scope of kitchen remodeling in St. Louis, MO along with complete kitchen design. STL Kitchen & Bath Renovations stays up to date with the latest in design approaches, and the quality of our work reflects beauty, function, and a great value. Our attention to detail leads to exquisite results, and this licensed St. Louis kitchen remodeling general contractor has a long list of 100% satisfied customers. We work with a variety of different designs and budgets that suit each individual client. Call 314-885-3258 for a FREE estimate on your kitchen or bath remodel today.